COLUMBUS, INDIANA (June 8, 2018) – Cummins Engine Company holds itself up to high standards when it comes to helping its employees and their communities. They plan many activities such as their recent 2018 CEP Day of Caring as well as multiple smaller activities throughout the year. Past and present employees are always encouraged to participate in these phenomenal activities, and surrounding businesses even often get involved. 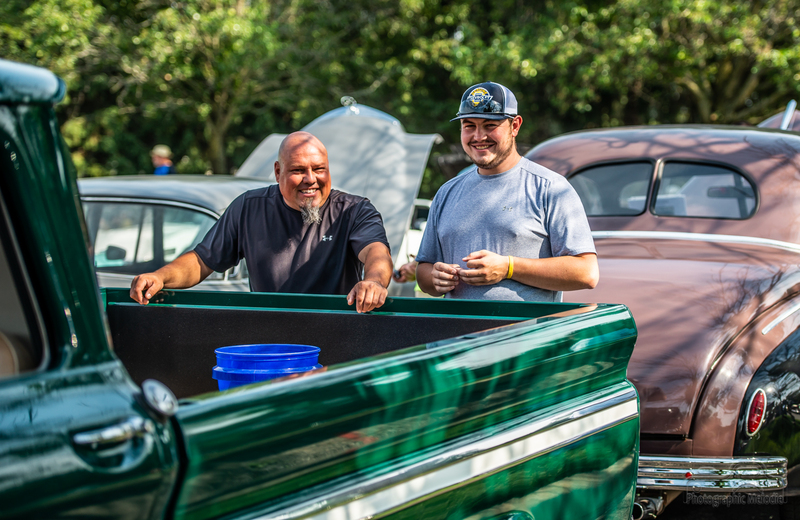 A recent more grandiose event put together by a number of Cummins’ most hard-working volunteers is the annual car show held to raise money for Love Chapel. Love Chapel is an outreach program serving all of Indiana’s Bartholomew County. An army of beautiful people plan stealthily for the day each year. Their goal is to run a smooth event while minimizing costs and maximizing profits in order to give Love Chapel the proceeds that it so desperately needs and deserves. Each year Cummins’ Annual Car Show grows, and it just keeps getting better. The show was staged right on the front porch of the worldwide corporation’s main branch in Southern Indiana. Cummins Engine Plant, or Plant 1 as it is lovingly refered to locally, houses assembly and machining lines for multiple Cummins products in the architecturally stunning town of Columbus. Although it was business as usual inside that day the magnanimous company was not afraid to open its front doors to guests as the sun beat down steadily on attendees. Multiple employees with hearts of gold braved the heat all day continually, however, to ensure guests were comfortable and a wonderful time was had by all. The event was open publicly and one of the biggest since its beginning over a decade ago, so the volunteers had their work cut out for them. Some sold snacks and some directed the sensational vehicle’s to their respective spots, but possibly the hardest task was had by the lunch duty crew. Somehow they all managed to serve with a smile, however, despite the line made rabid by the smell of grilling meat that stretched seemingly multiple city blocks. The fresh grilled picnic lunch soon came to an end, and each and every Car Show attendee and participant were all smiles a mile wide. They carried their full grins and full bellies back toward the magnificent muscle car laden lot to gaze at the vivacious vehicles just a bit more before the end grew near. The days events came to a close all too soon for volunteers and vehicle lovers alike. In just the blink of an eye that vast expanse decked to the nines and filled with award-winning automobiles was once again the same old CEP parking lot as per usual. For Cummins and its employees it might have just seemed like another day on the job, but for the event attendees and beautiful humans at Love Chapel it was an awe-inspiring act of love and one more step towards making the world a better place.